When choosing the best vegetable to juice, pick the ones which can give you large amounts of nutrients and lesser calories. With that, beet greens are the perfect crops to get. There is no need to wonder why these crops are popular in different cuisines all across the globe because every serving is packed with deliciousness and essential vitamins and minerals. Also, it is believed to have medicinal properties, which adds to the reason why it is the perfect pick. 1. Perfect for those who are trying to lose weight. Juicing beet greens will not just assure you of the appetizing flavor, but it is also very low in calorie. Therefore, if you are trying to lose excess fats from your body, you start juicing beet greens with good automatic juicer and deposit more nutrients to your body, without worrying for any large amount of calorie intake. Based on records, heart disease and heart attacks, usually triggered by high blood pressure are the most common killers around the world. Studies have shown that juicing beet greens can help you lower your blood pressure down to its normal range. Accordingly, the lowering effect is caused by the high concentration of plant compounds, nitrates. With this substance, it causes dilation of the blood vessels, thus pulling the pressure to drop. 3. Improves agility, which is best for athletes. Again, it is due to nitrates! As described by several studies, these dietary nitrates help the athletes in their performance. It strengthens their muscles, which enables them to perform high intensity exercises. The daily intake of the juiced beet greens for six straight days have dramatically improved agility of the athletes. Another study support the claim that 500 ml of juicing beet greens can help improve the cycling performance as it increased the oxygen use of the cyclists, giving them more energy to drive more miles. In many instances, these athletes are consuming the beet green juices 2-3 hours before their training in order to maximize the potentials of the crops in helping them with their routines. 4. Beets have high anti-inflammatory properties. 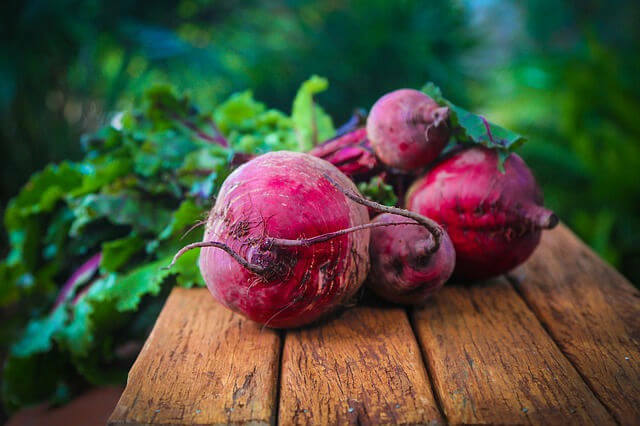 Aside from vitamins and minerals that can be taken from the beet greens, you can also get a pigment called betalains, which possess a number of anti-inflammatory properties. You should know that these chronic inflammations in your body may result in serious diseases like obesity, cancer, liver failure and heart disease. In one of the studies conducted, beet greens have not cured any mentioned condition, yet it alleviated the pains suffered by the patients with those ailments. Thus, that result has inspired more scientists to dig into the positive effects of this pigment that is a natural extract of a beet greens. 5. It improves digestive health. This is not talking about losing weight, though it is still strongly connected with it. With the rich fiber beet greens, it improves the metabolism of your body, thus, ideal for those who suffer from constipation and any other digestive problems. In addition to this, with the improved metabolic rate, it can enhance more the absorption of the needed nutrients of your body, which is very important to keep all the organs functional and healthy. 6. How Do You Choose a Beet greens for Juicing? Make sure that you are getting the best kind of beet greens for your juicing. Choose those firm and smooth beets. Never get the hardened ones as you cannot extract much juice from that. For the size of the crop, you can pick anything you want – that is for your personal preference. Never drink the beet greens juice all by itself, pair it with some sweetened extracts, like apple juice perhaps. Also, add more beet greens to it. In some instances, pure beet juice can cause discomfort to your vocal cords and overall health condition, therefore, use it with caution. It is believed to be a powerful antioxidant agent, which is why it is recommended to use it moderately. It is already proven that the beet greens have different composition with its roots, yet both have powerful healthy benefits. If you are just juicing beet greens, you can also add it with cucumber and carrots, to improve taste and appearance. What Is More To Expect From Beet Greens? Read on to discover more what exactly you are missing about the health benefits of juicing the beet greens. It is a great source of IRON. Just one cup serving, which is the recommended amount to consume, can provide you already with 15% of the daily needed iron in your body. Magnesium and Calcium are perfect for your bone health, wherein beet greens can deposit 25% of the daily needed amount of your body. Some have attested that beet leaves taste like that of spinach leaves. Therefore, if you like the latter, then you will surely every serving of beet green juice. Anyways, like any other juices, you can always mix and match with other extracts in order to explore more and improve the flavor. You got many options for this. With automatic or manual juicing, you can never go wrong with beet greens. Just practice caution with the roots if you want to include it in the mixture. Get more other extracts so you can enjoy more your drinks. For every sip, always bear in mind that you are drinking for your health that your older self will thank you for the effort. Juicing During Pregnancy: Is It Possible and Recommended?